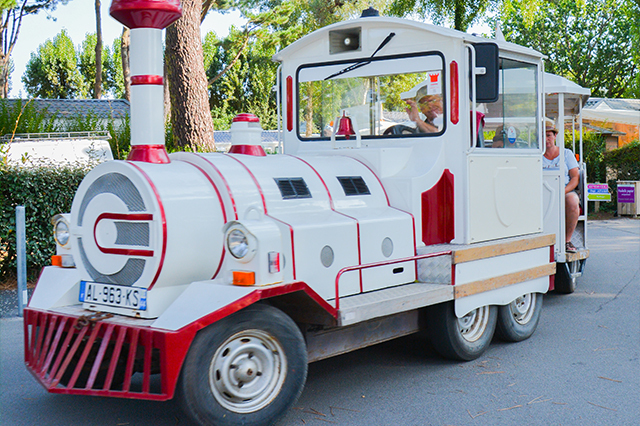 Go back to childhood and climb aboard the tourist train of your campsite south of the Golf du Morbihan. On your camping club next to La Baule, memories of childhoods rhyme with holidays! Find your innocence the time of a trip by small train, to heaven on earth between the Wild Coast and the bay of Pouliguen. Capi still wanted to impress with his ideas of genius, and it’s a successful bet. The squirrel mascot of your authentic campsite in Loire Atlantique has made available to all holidaymakers in Leveno a small tourist train worthy of a large amusement park. With this new, completely new, completely free experience, take advantage of an original means of locomotion to visit the various lively squares of your holiday club. 13 stops are spread over the estate. They allow easy access to the water park, with slides, steam room and deckchairs to rest around the pool; on the meadow, the large leisure area with bouncy castles, football and beach volleyball courts, mini-golf, quad circuit and bowling alley; the different playgrounds at the four corners of the campsite. A true itinerant attraction, the small train of the campsite leaves you and your children unforgettable holiday memories. 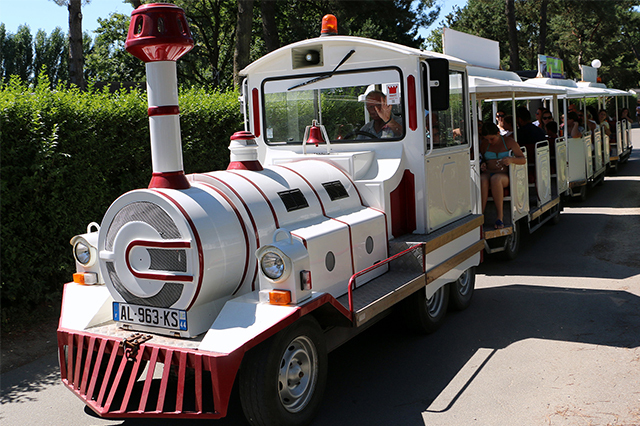 The small train of the camping club Leveno field in Guérande is a service offered only during the July-August school holidays. It runs every day of the week except Saturday (arrival-departure day). All information is available from your reception service.